Historically, indoor Marijuana-Mushroom grows have been “no big deal” to law enforcement as a HazMat or public health concern. 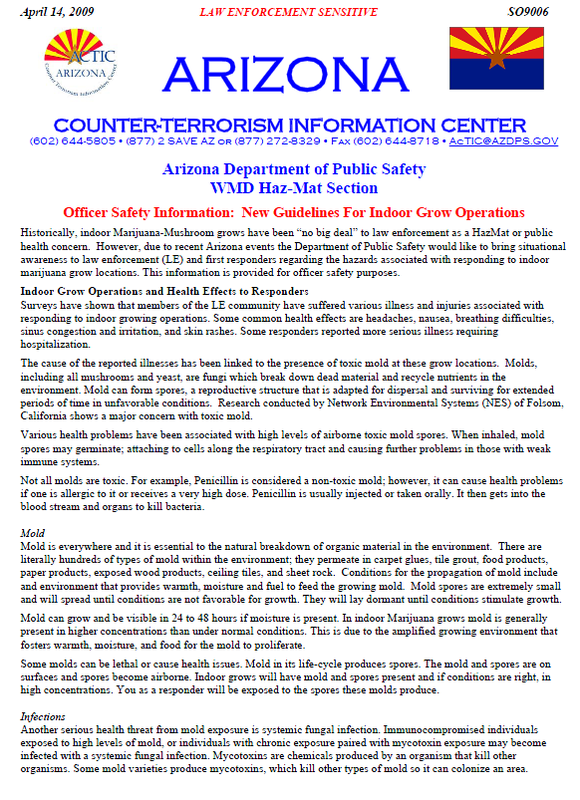 However, due to recent Arizona events the Department of Public Safety would like to bring situational awareness to law enforcement (LE) and first responders regarding the hazards associated with responding to indoor marijuana grow locations. This information is provided for officer safety purposes. Surveys have shown that members of the LE community have suffered various illness and injuries associated with responding to indoor growing operations. Some common health effects are headaches, nausea, breathing difficulties, sinus congestion and irritation, and skin rashes. Some responders reported more serious illness requiring hospitalization. The cause of the reported illnesses has been linked to the presence of toxic mold at these grow locations. Molds, including all mushrooms and yeast, are fungi which break down dead material and recycle nutrients in the environment. Mold can form spores, a reproductive structure that is adapted for dispersal and surviving for extended periods of time in unfavorable conditions. Research conducted by Network Environmental Systems (NES) of Folsom, California shows a major concern with toxic mold. Various health problems have been associated with high levels of airborne toxic mold spores. When inhaled, mold spores may germinate; attaching to cells along the respiratory tract and causing further problems in those with weak immune systems. Not all molds are toxic. For example, Penicillin is considered a non-toxic mold; however, it can cause health problems if one is allergic to it or receives a very high dose. Penicillin is usually injected or taken orally. It then gets into the blood stream and organs to kill bacteria. Mold is everywhere and it is essential to the natural breakdown of organic material in the environment. There are literally hundreds of types of mold within the environment; they permeate in carpet glues, tile grout, food products, paper products, exposed wood products, ceiling tiles, and sheet rock. Conditions for the propagation of mold include and environment that provides warmth, moisture and fuel to feed the growing mold. Mold spores are extremely small and will spread until conditions are not favorable for growth. They will lay dormant until conditions stimulate growth. Mold can grow and be visible in 24 to 48 hours if moisture is present. In indoor Marijuana grows mold is generally present in higher concentrations than under normal conditions. This is due to the amplified growing environment that fosters warmth, moisture, and food for the mold to proliferate. Some molds can be lethal or cause health issues. Mold in its life-cycle produces spores. The mold and spores are on surfaces and spores become airborne. Indoor grows will have mold and spores present and if conditions are right, in high concentrations. You as a responder will be exposed to the spores these molds produce. Another serious health threat from mold exposure is systemic fungal infection. Immunocompromised individuals exposed to high levels of mold, or individuals with chronic exposure paired with mycotoxin exposure may become infected with a systemic fungal infection. Mycotoxins are chemicals produced by an organism that kill other organisms. Some mold varieties produce mycotoxins, which kill other types of mold so it can colonize an area. Tactical operation: Is the suspect present and armed. Is there a danger of exposure? SWAT operations should wear minimal gear consisting of: full face APR, Tyvek suit, booties, and gloves over their Nomex. Consideration should be given to use of SCBA and splash protection in the event indoor Marijuana grow and a clandestine drug laboratories are present. Booby traps: Is the indoor grow protected, and how? As above, EOD generally fall under SWAT operations and follow the minimum guidelines. Air quality: Is there insufficient Oxygen or too much Carbon Dioxide to sustain life? Mold: Is the moisture contributing to increased mold presence? Consider the newly adopted guidelines and follow the clandestine laboratory procedures. Pesticides, fungicides, and fertilizers: How much is present and what are the concentrations? These additives come in liquids, solids, powders, and aerosols and may not be properly marked. Some are toxic, skin absorbed, inhalation hazards, possibly flammable, and may be incompatible with other chemicals. Electrical: How is the power being used or supplied and is it up to code? Is there a spider wed of extension cords. Is the power being stolen? Is there a potential for a spark or fire due to electrical overloading. What are the conditions of the circuits and lighting? Additionally, what are the fall and trip hazards? PPE: What PPE will you use, will it protect your respiratory track or will you take anything home with you? Are you susceptible to mold spores? Entry operations should wear minimal gear consisting of: full face APR w/CBRN filter, Tyvek suit, booties, and gloves. Depending on the circumstances SCBA, Splash protection may be required. Studies have shown some people can fight off spore infection. But it also shows some cannot. Which one are you? Don’t gamble with your health, wear your PPE.